I volunteered at the ECETI Ranch in Trout Lake Washington, late August through mid November of this year (2018). 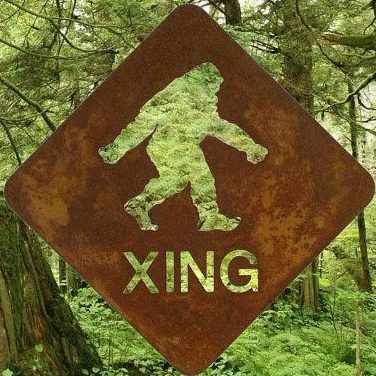 A tribe of Sasquatch are well known to hang out there. I went there knowing this, and inviting contact with them. My next thought was, “oh, I’m probably making that up…” and continued my conversation with my friend. The next morning I walked into the kitchen early. Walter was at the stove, he turned around, pointed to me and said “You!! You had a big Sasquatch right behind your tent last night!” His tent is in easy line of sight to mine. “Oh, I thought so!” I told him. And resolved to not dismiss these knowings so quickly. About a week later, again, I was on the phone with my friend, and walking from the volunteer field back to the main campus of the ranch. It was 10 pm and pitch black, no moon. I had my phone’s flashlight to pick out the path across the field. I was just getting to where the little wooden bridge cross over the brook through the trees. On my left was a little clearing, and 3 wooden platforms had just been erected there, 10’x10′, just a few days prior. I couldn’t see anything, of course, but I knew they were there. Suddenly, I hear this very loud smacking sound, as if someone with very large feet was jumping and dancing on the platform. It sounded exactly like someone/thing had just discovered this new construction in their environment, and wanted to see the sound their feet could make! It was very loud, erratic thumps and slaps. It only took a nanosecond to figure out that it couldn’t be a human–too much noise, and pitch black. The goosebumps erupted into huge tingles all the way up my spine to the crown chakra, which exploded with light. Instantly the sound stopped; the Bigfoot’s attention was on me, and the feeling of the goosebumps increased tenfold. And in my mind’s eye, I saw exactly what happened next. It leaped off the platform–I heard a crackling swish as it passed through the brush–and then a soft landing … and it was gone. COOL! I was so happy to find this site and read all these other experiences! I am thrilled for you!!! Awesome experience of JOY & TRUST!!! Thank you for sharing with us! So, so special for you!! !